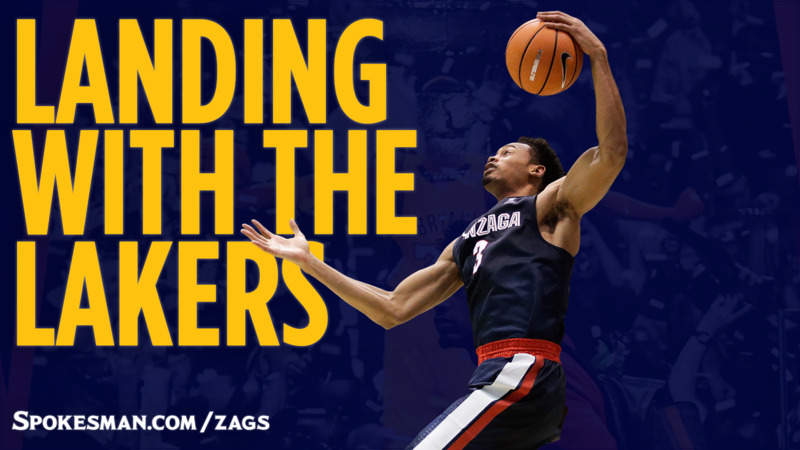 UPDATED: Fri., June 22, 2018, 6:13 p.m.
Former Gonzaga Bulldog Johnathan Williams will play with the Los Angeles Lakers in the NBA Summer League, the forward confirmed in a text message. Williams expects to report to the Lakers on Thursday. Los Angeles will play in the Sacramento and Las Vegas summer leagues. Every NBA team will be represented in Las Vegas, so NBA administrators should see a great deal of the athletic, 6-foot-9 Williams. Williams, a two-time All-West Coast Conference selection, helped Gonzaga reach the 2017 national title game and the Sweet 16 last year. His contract with the Lakers includes a partial guarantee, which typically means a certain amount of money even if he doesn’t make the roster. Sacramento’s Summer League, which includes Golden State, Sacramento and Miami, runs July 2-5. Games in Las Vegas are scheduled from July 6-17. Williams is the fourth free agent to sign with the Lakers following Thursday’s draft, joining North Carolina’s Joel Berry II, Oklahoma State’s Jeffrey Carroll and Kansas’ Malik Newman. Berry was MVP of the Final Four after UNC edged Gonzaga 71-65 in the championship game. The Lakers’ Summer League crew should include draft picks Moritz Wagner of Michigan, Kansas’ Svi Mykhailiuk and German teenager Isaac Bonga. Wagner and Bonga are 6-10 and 6-9 forwards, respectively. The draft picks will be joined by the free agents and some Lakers’ returners but probably not Lonzo Ball or Kyle Kuzma. Williams, who played two seasons at Missouri before transferring to GU, averaged 13.4 points and 8.5 rebounds last season, both team highs. He made 61 percent of his shots inside the arc and 32 percent on his 3s in two seasons at Gonzaga. The Zags went 69-7 in Williams’ two years. Published: June 22, 2018, 5:35 p.m. Updated: June 22, 2018, 6:13 p.m.